Read more about What do I look for in a handbell composition? 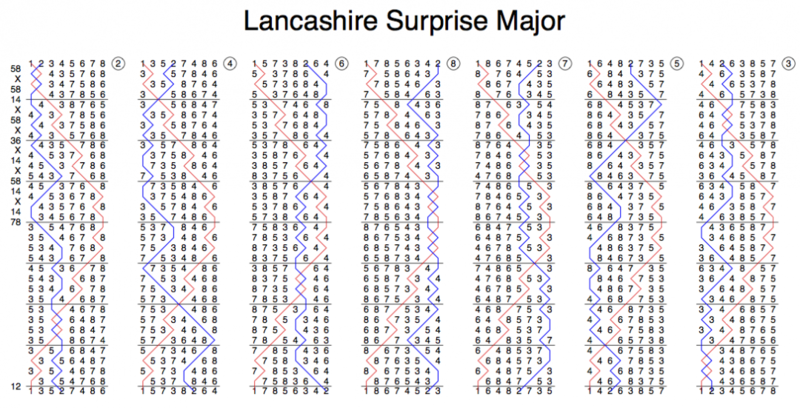 We started March with a quarter of Lancashire, which was the first one in the BellBoard list for the method of the month. I expected us to find it more difficult than some of the new methods we have rung, so I put together a composition with a snap start and 5-6 coursing throughout. After reading the Ringing World (it often doesn't arrive in Glasgow until Tuesday), I realised I had missed a trick - just calling six middles (bob, bob, single, bob, bob, single) is true, and an easier way to keep 5-6 coursing after the snap start. It took us a little while to get to grips with the method, despite our practice the previous week. There were at least five false starts, one of which lasted for a whole course, but we did get into it eventually and rang a good quarter. I hadn't really digested the fact that the last three singles are at consecutive leads, but I realised what was going to happen just before calling the first one, and it didn't cause a problem. What about the method? It starts like Whalley, although it's so long since we rang 23-spliced that this feature isn't very helpful. The points at the back are one place further from the lead end than they are in Bristol, which also means that they're at the opposite stroke. On the front, the points are further away from the half lead than they are in Bristol, which means that there's a longer period of 4-bell hunting when both of your bells are on the front. This contrasts with a problem I used to have in Bristol, of hunting for too long on the front and overshooting the points. Jonathan said that in Lancashire he was sometimes not hunting for long enough. The next day we rang it in the tower at practice night, and the fact that four of us had been ringing it on handbells was a great help. The tower bell ringing went much better than I had expected - we rang half a course, twice, reasonably well. Last Monday we rang a quarter of February's method, Double Dublin. I enjoyed it much more than I expected to - my memory of ringing Double Dublin as part of 23-spliced was that it can be a bit trippy, because of having to remember to do every variation with respect to Bristol. However, we rang it well. Jonathan called this composition, which has a lot of coursing for every pair - but only 70% coursing for the tenors. Also, 3-4 (which I rang) don't ring the 5-6 position, and 5-6 and 7-8 don't ring the 3-4 position. We haven't rung this style of composition of Bristol before, with the long blocks of calls in the same position. These blocks can generate plenty of musical runs, but they are a little tedious for the bells ringing the repeating leads. Also, the other bells get stuck on the front for a long time. Next week is March, so we're going to try a quarter of Lancashire. We practised it last week, learning it as we went along, and managed to get through a plain course. Let's see what we can do on Monday.